NOR_/D has just released their newest multitouch display system. The TouchKit Spark features a larger 35.4x23inch display surface than its predecessor, the Run. It uses ultrabright IR LEDs around the screen’s border for FTIR multitouch sensing. A high frame per second IR camera is included to increase tracking performance. 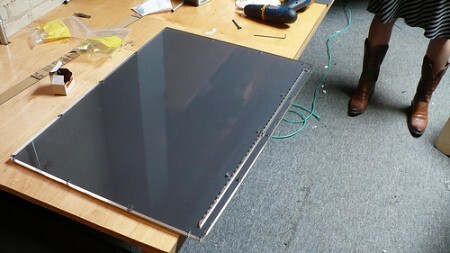 The screen is fully assembled, but you need to provide your own projector and case. It can be built at table height or as low as 20inches. The device is designed to work with OpenFrameworks, but future software releases will have TUIO support.